We are spoiled by today’s Alfa Romeo. We enjoy the messy but incredible Quadrifoglio, and people seem to even like that crossover thing called the Stelvio it’s selling, too. 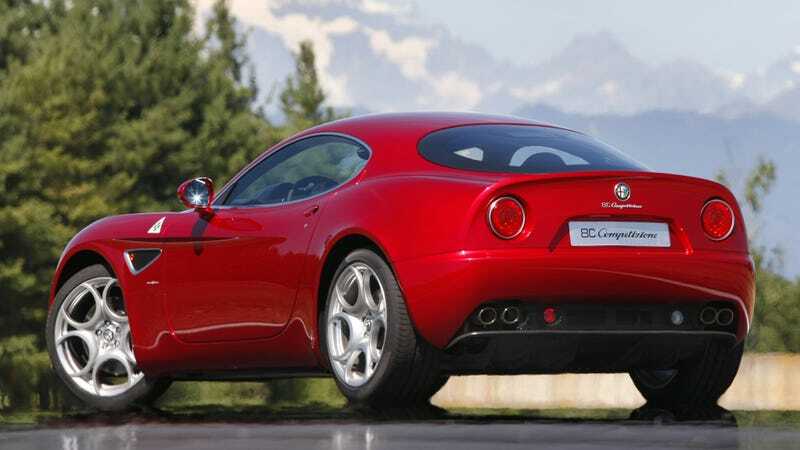 And while the 4C officially brought the beautiful brand back to the U.S. in 2013, it was the gorgeous 8C Competizione back in 2007 that really launched the modern Alfa Romeo renaissance. We often forget that Alfa of the ’90s was stuck making a lot of disposable, questionable-looking front-wheel drive sedans and coupes. Not a lot of it stands the test of time today the way the classic stuff does, and none of it is as desirable as the Quadrifoglio sedan. So let’s go back to when it started getting good again. In the latest review from Harry Metcalfe of Harry’s Garage, he walks us through what had everybody so crazy about the prospect of a 4.7-liter V8 Alfa Romeo coupe. In unsurprising form for Alfa Romeo, the car felt just slightly off in many ways. It had almost no luggage space despite seemingly having enough room in the rear haunches for a trunk, the black paint job had more colored fleck in it than some entire German automaker lineups, it had a reversing beep apparently stolen from a garbage truck, and the suspension was so harshly tuned even completely replacing it, in this case, didn’t solve its rough handling. To be honest, the handling really makes it seem a lot like a bad car. But then you step back and look at the craft of it all, and it’s just incredible. As Harry says, though, just don’t drive it in the rain. There’s absolutely nothing wrong with just staring at it in the garage.